Dawn’s dream has always been to help create dreams for others by donating her product, money or time to support nonprofit organizations both locally and globally. Dawn’s passion for helping women and children equals her passion for making wine. Dawn has produced award-winning wines of exceptional quality and elegance while maintaining a business model that allows for the opportunity to give back. 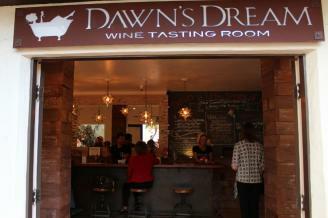 Please join us at Dawn's Dream Tasting Room in beautiful Carmel-by-the-Sea where we are surrounded by breathtaking scenery, fine wines, and delicious food. Whether you are out with a group of friends or your main squeeze, Dawn's Dream is the perfect getaway spot for exuberant or intimate gatherings where everyone--even your dog--is welcome. Our Tasting Room is a perfect venue for up to 50 guests for private events as well. Directions: Our tasting room is in downtown Carmel-by-the-Sea. Description Our tasting room is about a 1,000 sq ft space that is available for private parties/events of any kind. Private event contracts will be produced for each event upon request and the booking events is based on availability.